Naxos Dock, Naxos Island, Cyclades Greece. Perfect luxury sailing experience with our brand new lagoon 400s2 that guarantees your safety and unprecedented moments at your trip. 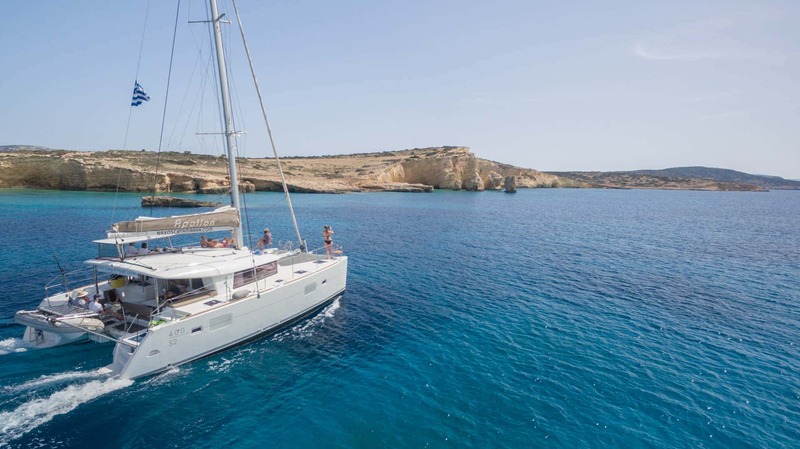 Our catamaran ‘’S/Y Apollon’’ features 4 double cambins with 4 en-suite bathrooms, the large hull windows offer you plenty of natural light in each cabin. During your sail you will be offered homemade delicious local flavors, always prepared with local products and local wine. Our experience combined with our personalized service will make your cruise unique. The Cyclades, meaning the circular islands, have ancient Delos at their centre. According to Greek mythology, Poseidon, God of the Sea, was furious at the Cyclades nymphs and turned them into islands. Perhaps that is why the smaller islands are so magical. Naxos Catamaran S/Y Apollong sets sails at 8.30 and returns at 18.00 to Naxos Dock. Sailing, swimming and snorkeling in the turquoise waters of the Aegean Sea.